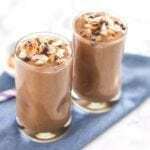 Dark, chocolatey and full of coconut flavour, this Chocolate Macaroon Smoothie tastes like dessert but is healthy enough to enjoy for breakfast. You’d never know there were greens hiding inside! Blend all ingredients except toppings until completely smooth, adding ice as needed. Pour into a tall glass, garnish and enjoy! If you choose to make this a warm smoothie, note that the consistency will be more like that of a latte than a thick icy smoothie. It’ll be just as delicious though!